Photograph was provided by Tokuko Kikuchi. 1916 Born May 1 in Hanamaki City, Iwate Prefecture. 1938 Age: 22 Graduated from Oriental Photography School. 1941 Age: 25 Joined Toho-sha. As staff photographer, participated in creation of Army's information bulletin "FRONT." 1946 Age: 30 Established Bunka-sha with Ihei Kimura and others. 1948 Age: 32 After dissolution of Bunka-sha, began journey as free-lance cameraman. Starting with photographic portraits of scientists, turned hand to photographs for science magazines and educational books. Also, followed lifestyles and manners of people living in farm/fishing villages, and was active in broad range of other fields. 1990 Age: 74 October: Fell ill with acute leukemia. November 5: Passed away. 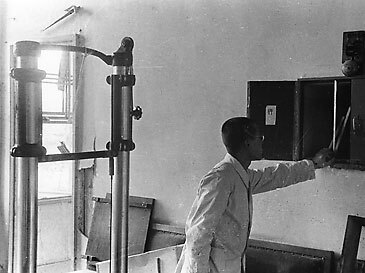 On the day of the bombing, a storage vault embedded in a wall in the X-ray room on the second floor of the Hiroshima Red Cross Hospital contained unused X-ray film. Radiation emitted from the bomb passed through the 1.3 cm-thick storage vault door and metal case, exposing the film and turning it completely black. 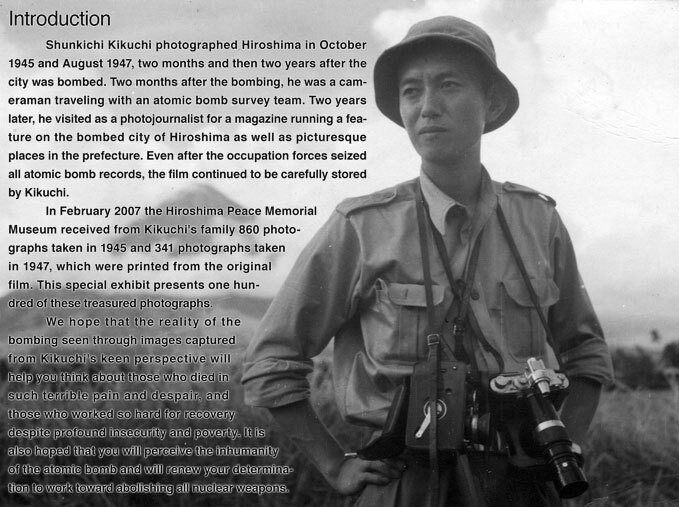 An academic survey team that included Shunkichi Kikuchi visited the Hiroshima Red Cross Hospital on October 6. They reproduced and took photographs of the condition of the storage vault at the time of the bombing.